Forehead lines or wrinkles run from side to side on the forehead. Forehead lines can involve the whole forehead or be worse in certain parts of the forehead. Often the lateral (outside) part of the forehead is involved in isolation. During ageing the brow starts to sag. The forehead then tries to compensate for the saggy brow by contracting to hold the brow up. This contraction of the forehead muscle causes wrinkles on the sides of the forehead. Frontalis muscle. This is the big muscle, highlighted in the image, that covers the forehead. The Frontalis muscle accentuates horizontal forehead lines when it contracts. The Orbicularis Oculi muscle is the ring shaped muscle around the eye. When the Orbicularis oculi is injected with Botox at the spot marked with the blue question mark in the image below, the outside edge of the eyebrow will lift a bit. This is known as a lateral (outside) eyebrow lift. A lateral eyebrow lift is often combined with Botox injections of the brow and forehead. The skin overlying the muscles to be injected is marked out with a skin marker. 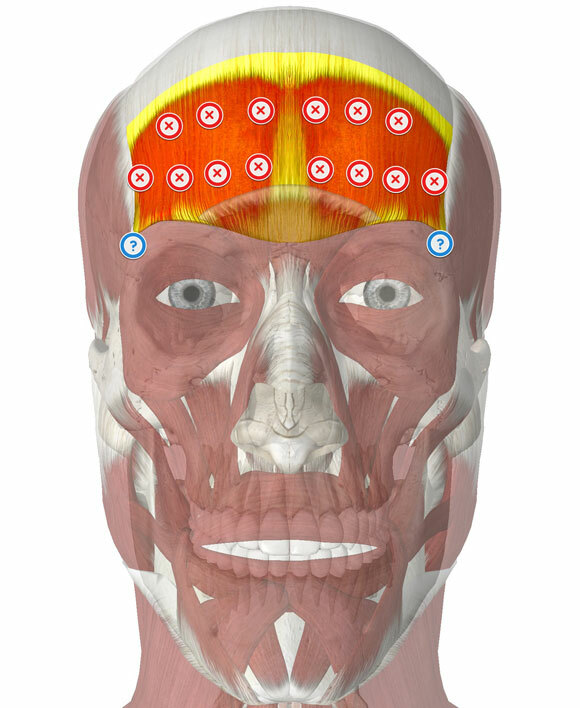 The exact placing of the injection points are different between people and depends on the muscle action observed when wrinkling the forehead. Botox injection of the horizontal forehead lines is always combined with Botox injections of the brow, because injecting the forehead without the brow might lead to heaviness or even slight sagging of the eyebrows. The muscles are injected. It takes about 1-2 minutes. I need a boxtox injection on my forehead. Im 37 years old, colored male with a slim body. How much wilk this treatment be and how regularly should I be injected. The wrinkles kind of makes me look a bit old for my age. Botox is repeated every 3-6 months. The cost is dependant on the number of units required for desired effect.